Once you integrate Pandadoc, you can craft and send quotes directly from Lily. Find out how it works and how to set it up right here. Firstly, you also need to have a PandaDoc account. Once you have that set up, follow this guide to set up your Lily-PandaDoc integration. Remember, you can choose which events involving the deal you want to see – so set up whatever you think is important for your team! 1. 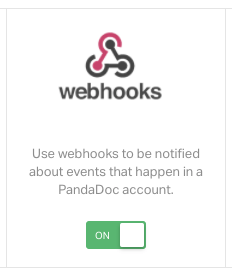 In your PandaDoc platform, enable the Webhooks integration. 2. Within the Lily environment: go to Lily -> Integrations -> PandaDoc -> Credentials. 3. Enter your Client ID and Client Secret, which can be found in Pandadoc. 5. Click 'Send' to save your credentials. 6. Once your credentials are saved, go to Lily -> Integrations -> PandaDoc -> Set up webhook(s). 7. Go to PandaDoc webhook and click + Create a webhook on the right. 8. Complete form as shown in the image below. 8b. 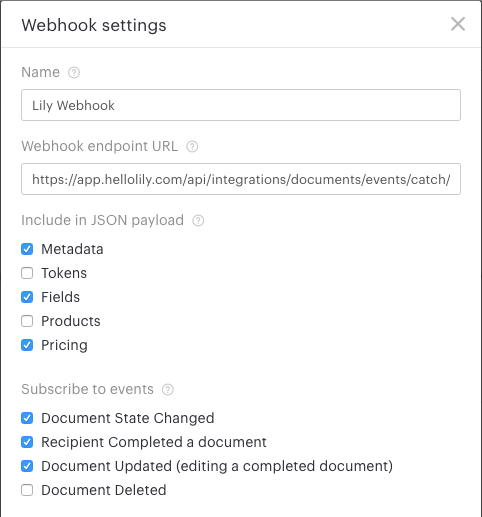 Use https://app.hellolily.com/api/integrations/documents/events/catch/ as webhook endpoint URL. 8c. Check 'Metadata', 'Fields' and 'Pricing' for the JSON payload. 8d. Subscribe to events; 'Document State Changed', 'Recipient Completed a document', and 'Document Updated (editing a completed document)'. 9. Open the webhook on the right, by clicking on the name. 10. Shared key field is now visible. Copy the Shared key. 11. Go back to Pandadoc webhooks in Lily and paste the Shared key. Click Save. Key will disappear which seems confusing, but it's hidden for security reasons and saved correctly. 12. Set up the webhooks you need based on what you want to see in your activity stream. 13. Notes are created in the activity stream when the event is completed if Add note was set to Yes. 14. Hit Save at the bottom and you're all set. Try it out for yourself! Let us know what you think or if you run into problems along the way by commenting, emailing us, chatting in Lily, or on Twitter.